A really well-put-together theme and puzzle today from title to revealer. 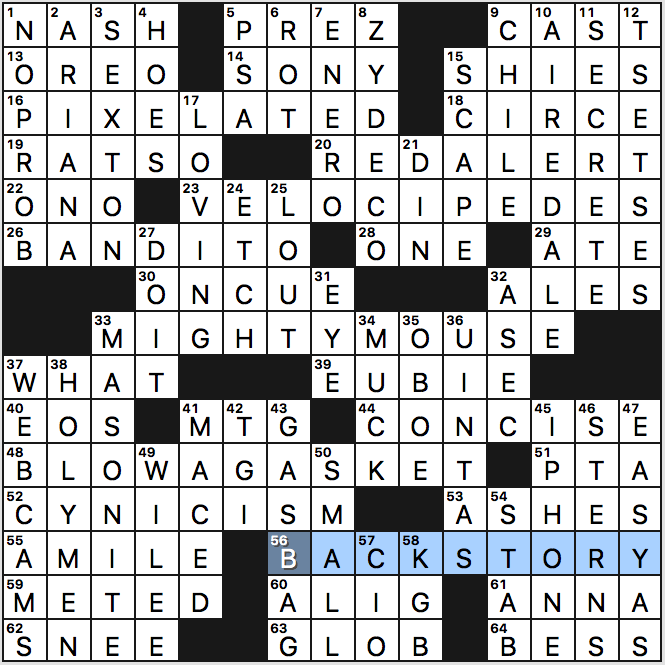 BACKSTORY serves as our conceit, clued as [Fictional past, or a hint to four-letter words found in the starred answers]. Each theme answer has a synonym for “story” inside it written backwards. 16a [*Digitally disguised] PIXELATED hiding TALE. 23a [*Early bicycles] VELOCIPEDES hiding EPIC. I love this entry, even though I needed most of the crossings to get the second half. 48a [*Fly off the handle] BLOW A GASKET hiding SAGA. A fun entry! What a fantastic set of themers! Each of them is interesting in its own way, even PIXELATED with its scrabbly X. I also love that each hides a different word yet, in a nod toward consistency, the hidden word is always four-letters long. Sure, the letters in question could have been circled, and maybe they would have if it was earlier in the week. But by Wednesday we should be able to work our way through the extra challenge. The solve proceeded smoothly until it didn’t. For a time I seemed to be at a standstill with a lot of gaps in the center and upper right. Entries that eventually became EUBIE [1978 Broadway revue that included “I’m Just Wild About Harry”] and UINTAS [Utah mountain range] stymied me. Then it all came unstuck when I realized my stupid error at 31d in which I had EAR instead of EYE for [Spud spot]. (We had corn with our dinner last night; that’s my story and I’m sticking to it.) Once I fixed that, MIGHTY MOUSE became obvious and I was mostly back on track. I was stuck with MASONITE [Hardboard brand] as well for a time. Never heard of that one; sounds like someone who belongs to a cult. Most of the fill here is pretty great. 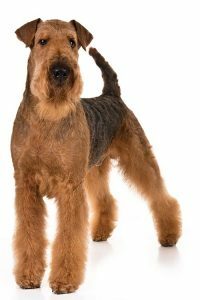 I especially like RED ALERT, CYNICISM, BANDITO, ZYDECO, and AIREDALE. All in all, a good challenge trying to find the backwards words, a great themeset, and plenty of fun fill. Four stars. This puzzle’s theme means well, but it’s cruel. Cruel, I tell you! People in the Upper Midwest and Northeast got walloped with still more snow. Chicago’s had double-digits-below-zero wind chills this week. March is “meteorological spring,” they claim. And yet where is my spring? 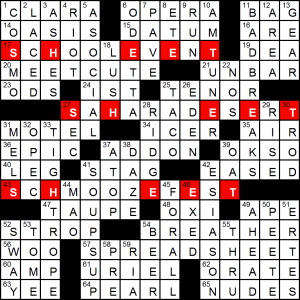 The grid’s 16 squares wide to accommodate the central answer in this two-pronged theme. We’ve got MARCH OF PROGRESS, WINTER WONDERLAND, and SPRING HAS SPRUNG as the long entries, and then there’s an “in like a lion, out like a lamb” word ladder in the middle of the grid, with circled LION, LIMN, LIMB, and LAMB. We’ve had other word-ladder themes with more rungs, but limiting it to four (plus the long themers) keeps the fill from being shot to hell by overcrowding. There was still rather more crosswordese-style fill than I like: OMOO, ENID, ALAI, TSAR, APSE, SIB (who really uses that word?) … at least it’s a Wednesday puzzle and not a newbie-friendly Monday or Tuesday. The theme is cute, but it taunts us with what is yet to be. The long Downs are terrific: HEAR THINGS, LET IT SLIDE, CORDON BLEU, and GIANT PANDA. 20a. [Bring up … or something brought up], REAR. Now thinking about twerking. 25a. [“The Amazing Spider-Man” director, amazingly enough], WEBB. I follow pop culture, but I can’t think who this is. Marc Webb? All right, then. Mental note made. 30a. [Alternative to Target], KOHL’S. Well … not so much. The drugstore aisles, the small appliances, the groceries, the school/office supplies, the outdoor furnishings that Target has are not, I don’t think, found at Kohl’s stores. At least not the Kohl’s near me. Clothes and bedding/towels, maybe toys? Not sure what all is on the second floor. 40a. [Readily open to change], LABILE. Odd clue. I really only know the word when preceded by emotionally. And someone who is emotionally labile isn’t so much “open to change” as struggling to maintain equanimity. 8d. [Irish girl’s name related to the word “honor”], NOREEN. Name etymology I didn’t know. I went to grade school with twin sisters named Noreen and Doreen. They weren’t Irish. 20a [Willie Nelson genre] COUNTRY WESTERN–As the reveal at 59d tells us, we’re to pay attention to “bookends.” Here that translates to CO- and -RN, CORN. 34a [Rush into battle] CHARGE AHEAD–Did I mention the reveal mentions “salad ingredients”? To find food here, we must use non-matching bookends: CHAR- and -D, CHARD. 43a [Not in jail, perhaps] ON PROBATION–… ON- -ION … ONION. 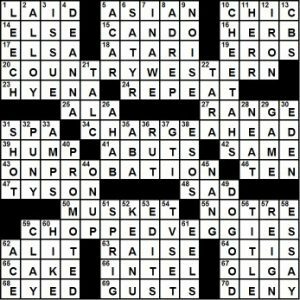 59a [Salad ingredients that bookend 20-, 34- and 43-Across] CHOPPED VEGGIES–What more is there to say about the theme? 15a “You betcha!” CAN DO–Dupe of a 2-letter word in 49d. Not a problem at all. 49d Be altruistic, say DO GOOD–See a5a. 10a They’re spotted on safaris CHEETAHS–A pun so pure it needs no ?! Capably and credibly done! 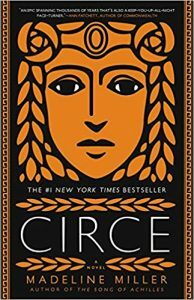 3.5 stars. Today features a slightly different (and therefore more interesting?) version of the typical “word hidden in all the themers”. SPREADSHEET is interpreted as being that SHEET is found non-sequentially in themers, rather than either in the middle or the edges, the more typical versions of this trope. SCHOOLEVENT is rather vanilla, but SCHMOOZEFEST is fun entry to end on. There are a couple of other top-notch entries. I won’t send you down the TVTropes rabbithole for MEETCUTE, but it’s a really lively addition to any puzzle. The other long downs also lent colour to the puzzle. My error was ESYASON/OXY. I don’t see myself being the only person to fall there. Like last week, this is a pretty simple theme – each answer has THAT in it. THAT’s it. The fill here is simple but well-executed, suiting the theme. 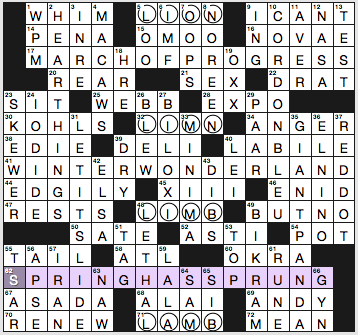 My faves were EM-DASH, KOALA, HOAR, OSSO Buco, OFF DAY, Dashiell HAMMETT, SHONDA Rhimes, POLL TAX, and CHORAL. I give WII-ITIS the stink eye, if only because that video game system is two cycles ago for Nintendo. This entry was posted in Daily Puzzles and tagged Andrea Carla Michaels, Brendan Emmett Quigley, Erik Agard, Mary Lou Guizzo, Michael Wiesenberg, Pancho Harrison, Roland Huget. Bookmark the permalink. Did anyone else think that the clue for LET IT SLIDE was off? As a teacher, I let plenty of things slide, but it has nothing to do with whether I’m bothered. To let something slide just means I choose not to punish something that I could punish. NYT: I too was thrown off by the clue for LABILE, which makes sound volitional. That is not the implication I know, either in terms of mood and emotions or in terms of chemistry. It’s a characteristic that implies a lack of stability. Also something I am interested in understanding at the neurobiological level– what makes moods and emotions switch, or refuse to switch, is key to understanding mood disorders. I actually googled it after I finished the puzzle thinking maybe there was a brand new meaning, e.g. social or sexual, that I was unaware of. Yeah, the theme does highlight the bitter cold. Is that the LION part? Although I’m not sure there’s a LAMB in sight. ‘Labile’ hypertension is a pretty common blood pressure symptom– aka ‘white-coat’ hypertension that happens when you’re in the doctor’s office. NYT: Random tic-tac-toe lines, like OXX, are not great fill, but more so than their presence in grids, I’m bothered by their clues often referring to them as “losing” lines. Seems inaccurate to me — it’s not a losing line. If you make OXX you don’t automatically lose the game. Just one of those little puzzle pet peeves. Strange puzzle, I thought. I guess the constructors decided the LION to LAMB ladder was insufficient so added the long theme answers too. But I had never heard MARCHOFPROGRESS as a free-standing phrase and on googling it turns out to be the name of an old and largely bogus illustration of human evolution. Is that what the clue refers to? There’s a lot of awkward fill to accommodate the theme material, plus dubious clues for LABILE and LETITSLIDE. The whole puzzle felt overloaded and clumsy to me. I know that understanding star ratings here is a fool’s errand … but if you are rating today’s NYT with 1 star (1 person) or 1.5 stars (6 people!) then I just don’t understand what your standards are. Maybe the theme is not your cup of tea 100% (though I really liked it), and there is some crosswordese in the fill (though it’s all things that it would absolutely be reasonable to know/encounter outside of puzzles, not an NLER or OOLA in the bunch). But it’s a cleverly constructed puzzle with an interesting two-level theme with high theme density and some strong longer fill. I just really wonder how people calibrate their ratings. I think some people dislike word ladders. I’m neutral about them, myself. I, too, don’t think that disliking word ladders is a good enough reason to give a puzzle a low rating. Even if one ignored the word ladder entirely, this would be a well-constructed puzzle with a very smooth solve. That’s an inherent problem with ratings. Do they reflect a subjective or objective view? If subjective, how much does a solver penalize for a single clue or entry he or she finds offensive? A kind of theme (word ladder, step quote, ordinary quote, vowel run, sound substitution …) that is common or boring to the solver? If objective, how does any one solver rate a technically amazing construction that’s a meh solve? Obviously, a puzzle that “does it all” will have a well deserved high rating, but the average, imperfect, puzzle will have ratings all over the place because there are no standards for judging. BTW, that’s the way it should be IMO. Quantifying art never goes well. Also, everyone has their idiosyncratic likes and dislikes. For example, I can’t tolerate ‘vowelless’ puzzles. Go figure. My guess is that I don’t really perceive words as combinations of letters– and being forced to do that drives me crazy. 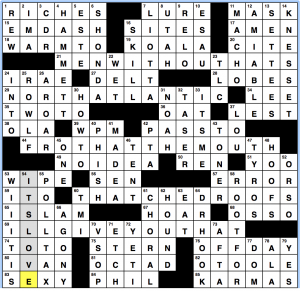 If I had to rate a vowelless puzzle it would get a zero. I hope you enjoyed this dance. I once gave a puzzle a one-star rating. I was in a cranky mood and something about the puzzle bugged me, I can’t remember what. But then I immediately felt guilty for giving in to irrational feelings and have never rated a puzzle since. I liked that there were no circles, and I had to figure out the theme myself. Plus, Mighty Mouse! Wile E. Coyote! And BANDITO brought the Frito Bandito from the recesses of my memory.